Ninjas In Training : The Ninja Babes! Welcome to the next installment of Ninjas in Training! The true beauty of Ninja Warrior is that is requires such a huge cross section of skill-sets, and so everyone tackles their training in a completely different way. So, we’ll be asking friends of site to share with us their approach. Today we want to celebrate the inclusiveness and support that is The Ninja Babes. 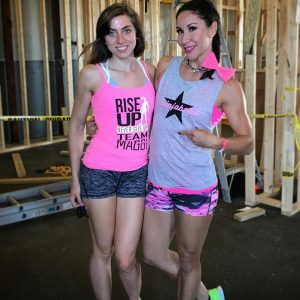 This movement was started by Cara Poalillo who is an artist, a model and most importantly (to this interview at least) a super strong and super fit competitive ninja…. Cara has been kind enough to give us some of her time to share her projects, her training and experience in the Ninja Warrior community. Cara! Thank you so much for this interview! 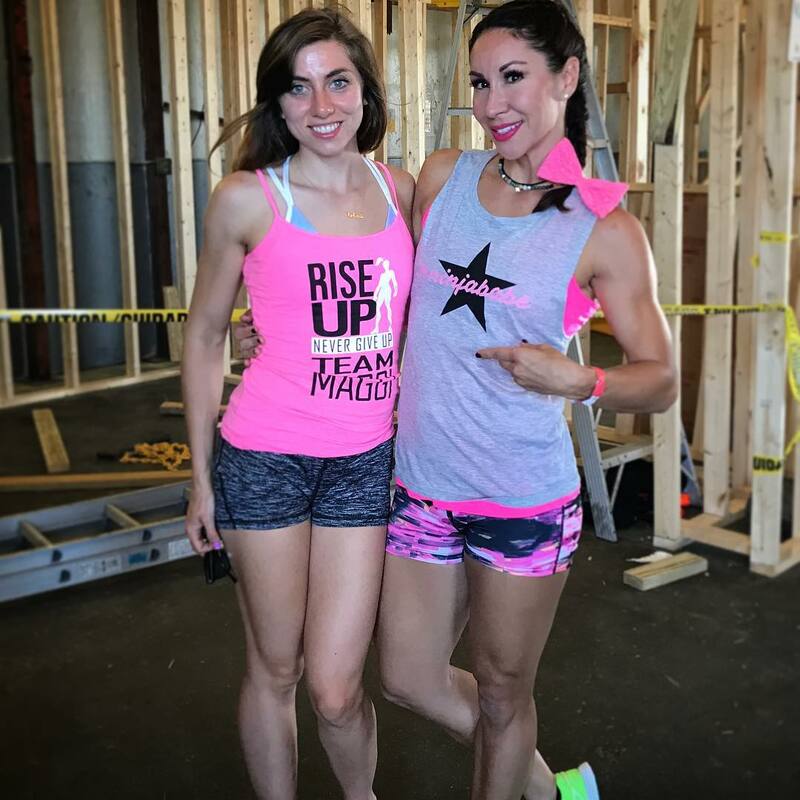 I’ve been meaning to find out more about The Ninja Babes for a while, but seeing my friend Cristin rocking one of your shirts pushed me into action… what is the idea behind The Ninja Babes? 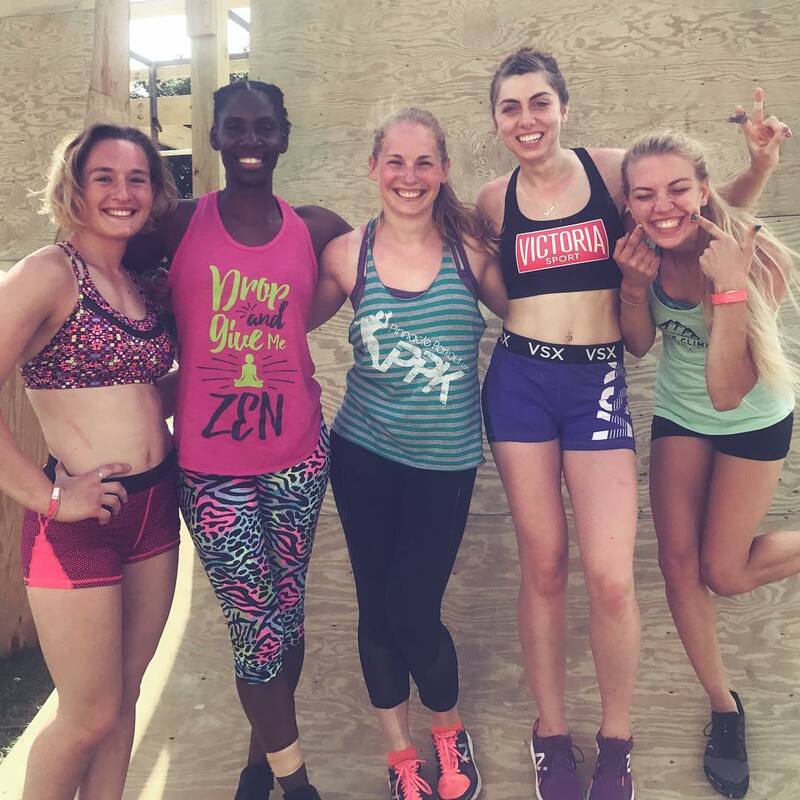 Ninjababes is female ninja athlete empowerment group that is all about being proud of yourself for where you are on your specific athletic journey and encouraging other women to do the same. We provide encouragement, empowerment, and unity among ninjas through social media, fun merch, workshops and training groups, and the Ninjababes podcast. For some women they can feel like they aren’t a “legit” ninja until they have cleared a specific obstacle or ranked high in a competition. This type of thinking can just leave someone feeling insecure about their skills, negatively compare themselves to the ninjas who they deem as more “elite” than them, and all around just cause someone to feel bad about themselves. While doing well in a competition or completing a challenging obstacle is for sure part of striving to be a great ninja, we shouldn’t put ourselves down just because we haven’t accomplished a specific goal yet. 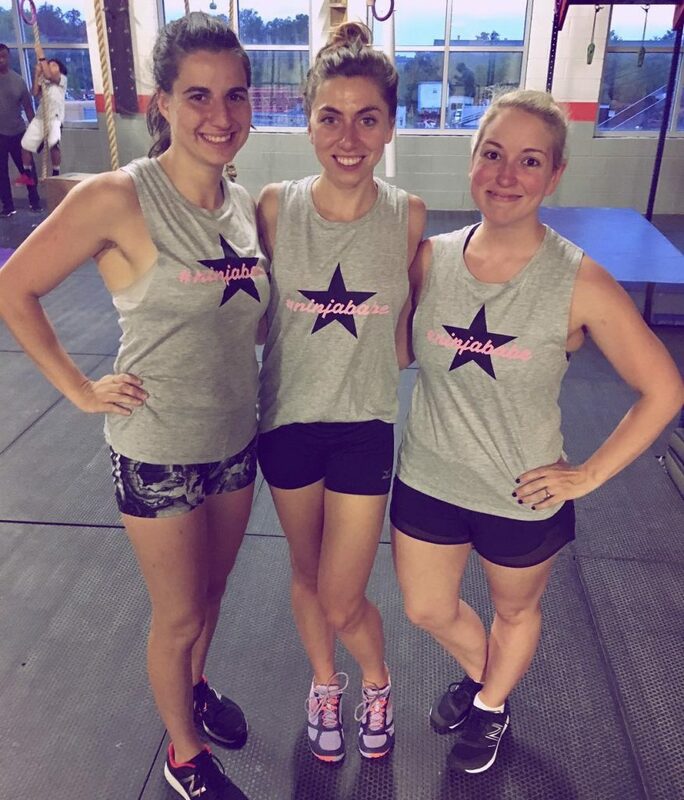 Ninjababes unifies ninja women to strive to be our best, and feel great about ourselves through every step of the ninja experience. It empowers women to believe that they are capable of accomplishing feats they did not know were possible. It is also an amazing network for linking female ninja athletes together and proving an empowering space for comradery, personal growth, training partners, and all things female athlete related. … and in case you didn’t catch that, YES NinjaBabes has a podcast! The first episode featuring ninja Michelle Warnkey will air the first week of October so stay tuned for a release date!! Who are The Ninja Babes? Australia is very recently, but absolutely entirely been swept up in Ninja Warriorness, can even Aussies be Ninja Babes? Yes! Aussies can be ninjababes and in fact ARE already! Well.. in a sense. The moment a woman steps out onto her first ninja obstacle and decides that she is embarking on the journey of learning ninja warrior, she is in essence a ninja. Aussie ninjas are killin it! I am so impressed by the community there and how quickly ninja has grown! I want all Aussie warrior women to know that they can be proud of themselves for their accomplishments and be confident in who they are as a woman and an athlete. I would love to have Aussie women ninjas join in the Ninjababes movement and spread the encouragement and self-confidence to all the ninjas they meet. 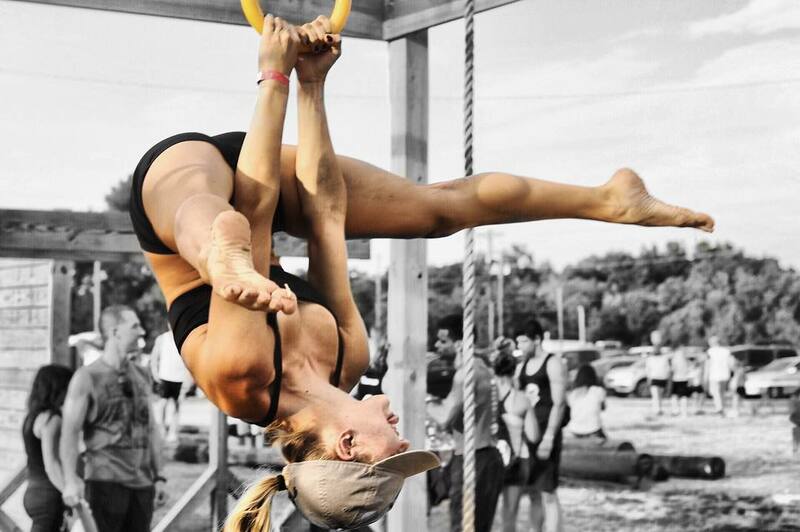 You’re a woman of many talents… and I’m sure have been in pretty deep with a couple of different communities, have you found the Ninja Warrior different to your other passions, or is it pretty much the same but with a different focus? I have been involved in the modeling and arts communities for about 7 years. I love the visual creativity and partnership in those worlds, but it is different than ninja. For example, with modeling there are many parts of a team that come together to make a photo shoot or a runway show happen; models, photographers, designers, makeup artists, creative directors, etc. There is a lot of collaboration and energy, which I also find in the ninja world, but there is a different kind of support and motivation with Ninja Warrior. I find the ninja community to be a heartfelt tribe in which everyone does their part to support one another. People are so willing to teach one another about obstacles and cheer each other on even if you’ve just met! You can travel to far away ninja gyms and make instant new friends that you’ll keep for years to come. I have been deeply impressed by ninjas and their humble support of one another in each of our endeavors on and off the course. Has your interaction with other ninjas changed your training? Since Ninja Warrior is still so very new to Australia and we’re very much finding our feet, do you have a favourite workout you can share with us? Yes, absolutely! I glean so much from listened to other ninjas’ advice and watching them train or crush a certain obstacle. I like to think the more ninjas I meet and train with, the more well-rounded I will be as a ninja athlete. One ninja in particular who has had a big impact on my training is Jen Tavenier, the Minneninja. 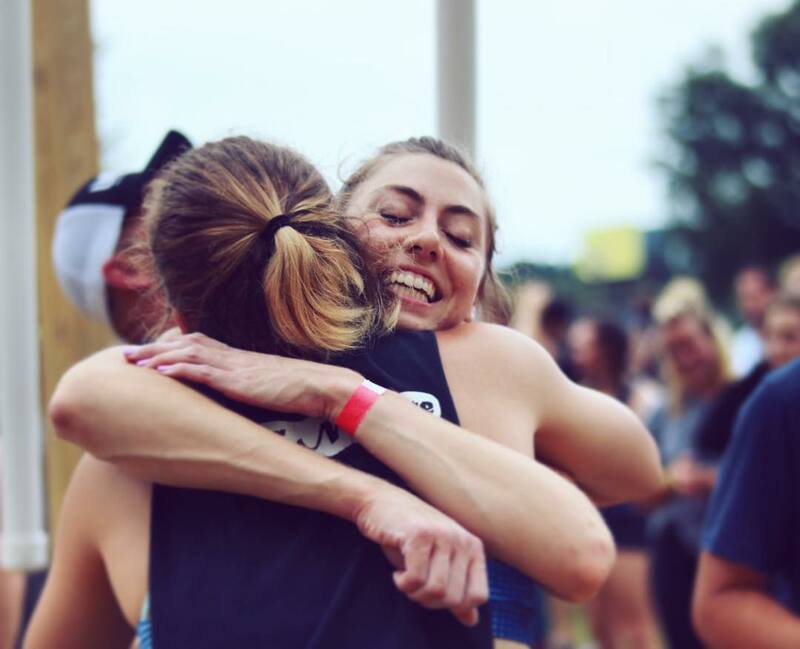 I met her at a National Ninja League competition in Minnesota last year and since then she has been an incredible inspiration to me. I use her Minneninja training app and I’ve found it to be a such a smart way for me to supplement my ninja obstacle training with strength training at the gym. I grew up playing sports and had great coaches and trainers all my life that have drilled into me the importance of good form, training hard while keeping muscle groups balanced, practicing mobility, and knowing how to listen to what my body needs. Jen has a personal training background, so I noticed right away that her training app is designed with all of those values in mind. She hones in on ninja skills while making sure muscle groups will continue to grow in balance. Her app has revolutionized my strength workouts, because I am able to train in ways that are specifically supplementing my ninja skills. I can see how her workouts have improved my grip strength overall ninja performance. My favorite exercise right now is hollow body movements and holds. My development of strong abdominal muscles only came so far until I learned how to hold a hollow body position and started incorporating that into everything I do. Hallow body position is key! It’s a tip I got from great ninjas like Jen Tavenier and Jessie Graff. Mike Cook’s Ultimate Backyard Warrior has truly changed me life. I feel like there is so much to say here… I have competed in UBW in May and August 2017. I have felt so empowered and loved by all the ninjas I met there. I ended up placing 8th and then 9th for women overall in my two experiences at UBW which was an amazing feeling. It is just incredible meeting ninjas from all over the country, many of whom have competed on American Ninja Warrior. No one is judging each other based on ninja ability, it’s just a welcoming, positive environment where brand new ninjas are mingling with well-known veterans like Jessie Graff and Drew Dreschel. I say my experience there has changed my life, because I was overwhelmed with kindness there. Imagine the best summer camp you’ve ever been to filled with all of your heros and future best friends waiting to meet you—THAT is what UBW is like. I feel there are no words to describe how impacted I have been by friendships from UBW and how inspiring it is to witness some amazing ninja skill and determination. Everyone has got to go at least once! Thank you so much Cara! If Ninjas want to get involved and/or follow The Ninja Babes adventurously supportive community, where should they look? You can find us on Instagram @TheNinjaBabes and listen to the podcast soon on Itunes! We have lots of fun shirts for sale to support the growing Ninjababes initiative. The best way to be involved is to BE a Ninjababe to your community by supporting and encouraging every ninja you meet. We will soon have a Ninjababes ambassador program with even more ways to be involved. Follow us on Instagram to stay in the loop of upcoming events and opportunities, and tag us and your fellow #ninjababes sisters in your posts! Thank you so much for interviewing me! It means the world to be able to spread the Ninjababes message and know that people are listening and want to join the initiative. I am so encouraged by this! Thank you! Thanks again to Cara for sharing her training, goals and progress. We wish her the best of luck to smash out 2017 & 2018! Please note : We can’t tell the future, we don’t know if our interviewees will actually make it onto Ninja Warrior. They are athletes that we find inspiring and hope you will too. If you’d like to share your training routines and motivations, please contact us. → ANW Fantasy – guess who crushed it? Ninjas In Training : Kadeem the Dream – 5.2 Ninja. Exciting times for the Ninja Challenge League! 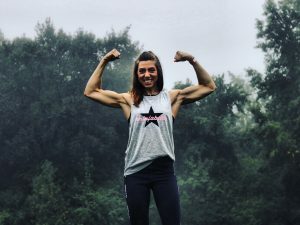 RILEY MURPHY on My time with the Australian Ninja Warrior application process.